In a recent Fast Company article, entitled, "The War For Talent Is Over, And Everyone Lost," the authors offer a solid explanation as to why technology has hurt our ability to find the right candidates for our job openings. It's becoming increasingly clear all the technology in the world won't help your company find top talent today unless your recruiters use the right techniques to attract and hire them. That means, some companies have the wrong recruiters on staff. The question is, "Is your company one of them?" There Are 3 Types Of Recruiters, Which One Works For You? Reactive recruiters like to "post and pray" on job boards. They're nothing more than online paper pushers. They rely heavily on job postings to get their talent. These recruiters are gathers of low-hanging fruit. They're limited in real recruiting skills and are forced to take what they can get for applicants. 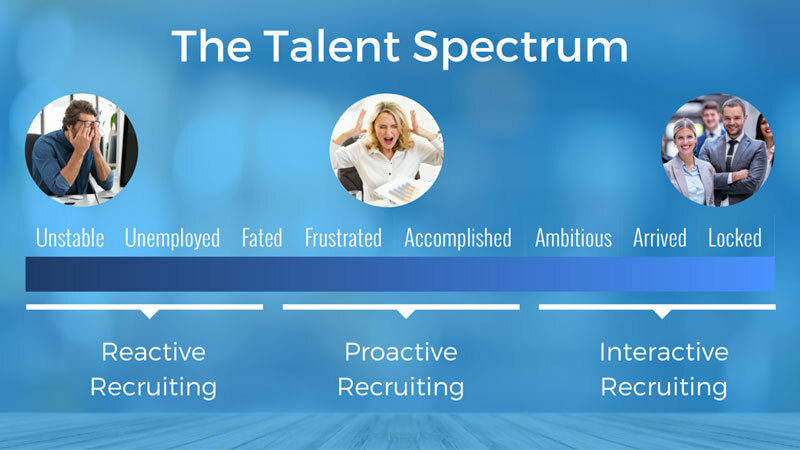 In a talent shortage like the one we are experiencing right now, reactive recruiters source the lowest skill level on the talent spectrum. Proactive recruiters are the hunters. They target the candidates they want to hire and use sales techniques to get their attention. This type of recruiter has greater success than the reactive recruiter because they know they need to connect with talent that doesn't bother with job boards. Think about it: really good workers are too busy being successful in their current jobs to be looking for work. Proactive recruiters know they must introduce top talent to their company for consideration. While there are a fair amount of recruiters at this skill level, in today's competitive talent market, they often resort to 'yell and sell' recruiting tactics as a way to get a candidate's attention. Proactive recruiters who fail to use the right techniques find it difficult to differentiate themselves from other recruiters competing for the same candidates, causing the company's ability to hire the best talent to suffer. Interactive recruiters aren't hunters or gatherers - they're strategic partners. They understand top talent doesn't want to be sold to. Interactive recruiters know how to build relationships with high-performing talent using a process for creating mutual trust and respect that leads to the candidate wanting to explore working with your company. Interactive recruiters understand how important showcasing their employer brand is to attracting and holding the attention of the type of employees their company needs. Interactive recruiters are often the unsung heroes of their company because they ensure the corporate culture is supported by the right new hires. The time it takes to fill an open position is getting longer. When you ask why you aren't seeing any good candidates, the recruiter says, "None applied." The amount of money your company is using on job postings and outside agency recruiters is climbing. Recruiting top talent isn't about technology, it's about technique. The better the skills of your recruiters, the better the talent you will hire. If you don't have interactive recruiters working for you, consider investing in the training and development of your recruiters. In the same way you can't give just anyone a hammer and nails and expect them to build a house, you shouldn't assume giving your recruiters access to technology (i.e. online tools and software), will make them successful at finding you top talent.